CompoundMiter, Inc. is the best source for information and products on how to cut and install crown molding and trim for the beginner do-it-yourselfer and the professional alike. We would like to thank each and every customer that has made this a reality. Our crown molding tools and information will save you all the headaches and frustration of turning your expensive crown into firewood. We have developed an Easy 3-Step Method that will make each and every cut perfect. 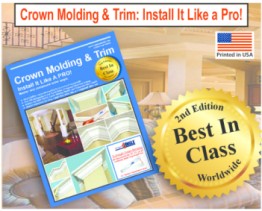 Our easy-to-use Crown Molding & Trim Book and our Charts/Tables, Miter Program and True Angle® Tools are guaranteed to give you professional results. Wayne Drake has been a mechanical engineer by profession since 1973. He has an extensive background in advanced mathematics and engineering graphics. He received his Bachelor of Science degree in Mechanical Engineering from Georgia Institute of Technology in Atlanta, Georgia in December 1972 and his Master of Science degree in Aeronautical Systems Engineering from the University of West Florida in 1976. His interest in cutting and installing crown molding and trim stems from his many years as a woodworking hobbyist. The event that led to the founding of www.compoundmiter.com (March 2000) was the construction of six of the large birdfeeders shown on his website and in Chapter 16 of his book. While making these as Christmas presents, he discovered after cutting all 24 gazebo roof pieces, the birdfeeder plans had the wrong miter and blade tilt angles. He then sat down and graphically derived what is now called the Compound Miter Chart© (pages 51 and 52) which illustrates the relationship between corner angle and crown slope angle for a compound miter cut. Today, www.compoundmiter.com is the best and only one-stop-source for information on how to cut any compound miter angle.